Domaine des Ormes is a 5 star campsite located in Dol-de-Bretagne in the Brittany region of France. Domaine des Ormes is undoubtably one of the best campsites in northern France if not the whole of France. This stunning campsite is set in the beautifully landscaped grounds of a stunning Chateau. The grounds are made up of around 400 acres of wooded parkland and are home to the extensive range of activities and facilities that make Domaine des Ormes the perfect family holiday location. 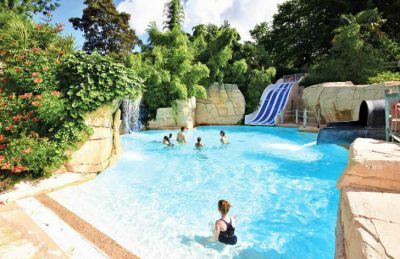 No matter what sort of holiday you’re after, you are sure to have a brilliant time at Domaine des Ormes. There’s plenty of space for you to relax and unwind, you’ll also find plenty of great places and things to see and do nearby and for those that want a campsite filled to the brim with activities then you really won’t have to look anywhere else. There’s even an 18 hole golf course on-site! As Domaine des Ormes is so great, the campsite can become fairly busy during high season but you’ll be pleased to know that there’s no need to worry as the campsite is well laid out with plenty of open space meaning you don’t feel overcrowded. Although Domaine des Ormes is located in the heart of the Breton countryside, the nearest beach is only 25km away and can easily be reached by car. Covered in sand, the beach is perfect for families and also those looking for a variety of water based activities with lots of space and activities on offer nearby. With such a great range of other activities on-site you may be forgiven for thinking that the swimming pool facilities may not be as good but believe us when we tell you that you’d be wrong. At Domaine des Ormes, you’ll find not just one swimming pool area but 4. There’s a lovely pool and children’s pool up by the manor house, then there’s a brilliant indoor tropical pool with slides, a further wave pool with slides and finally a lovely outdoor pool with slides, rocks and waterfalls. Domaine des Ormes campsite offers a comprehensive selection of activities and facilities on site and also nearby to ensure you have a fantastic family holiday. On-site activities at Domaine des Ormes campsite include tennis, table tennis, football, basketball, volleyball, gym, archery, boules, golf, driving range, mini golf, horse riding, pony riding, playground, climbing wall, adventure course, pedalos, cycle hire and wake boarding. Facilities available at Domaine des Ormes campsite include WIFI, restaurant, snack bar, pizzeria, takeaway, bar, groceries, fishing shop, gift shop, games room, tv room, animation team, washers and dryers. Accommodation at Domaine des Ormes campsite includes a range of 2 and 3 bedroom mobile homes and tents that are available from Eurocamp, Al Fresco Holidays and Brittany Ferries.